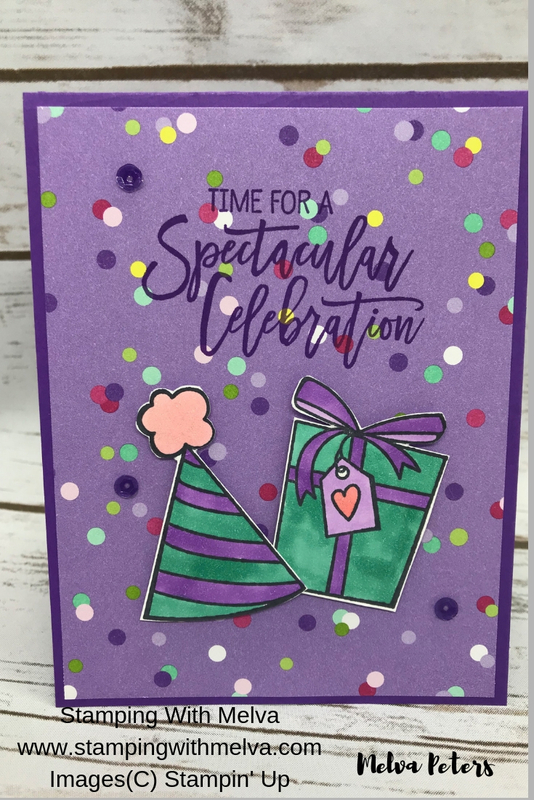 Today's card features the Birthday Cheer stamp set. I keep surprising myself by looking for paper from the Brights Collection when I go to make a card. 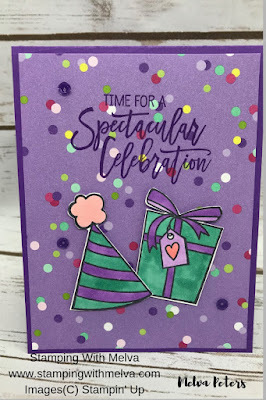 That isn't me usually, but all of the stampsets in the Occasions Catalogue just seem to call for bright and cheery colours. Check this one out! Score Gorgeous Grape Cardstock (4 1/4" x 11") in half to make card base. Stamp the birthday hat image and the present image on a scrap piece of Whisper White Cardstock using Tuxedo Black Memento Ink. Colour with Stampin' Blends. Fussy cut the images using Paper Snips. Cut a piece of How Sweet It Is DSP (4" x 5 1/4"). Stamp sentiment on the top in Gorgeous Grape ink. Adhere to card base using Snail. Adhere 3 Gingham Gala Adhesive-backed sequins to card front. Everything I used on this card is available in my Online Store. You can check out the list of supplies below. When you place a $50 order (before shipping and taxes) using the Host Code TSKSQEH6, I'll send you four cards and instructions by mail as a thank you. If your order is over $200, please do not use the Hostess Code as you'll qualify for Stampin' Rewards, but I'll still send you the 4 free cards! Have you checked out my upcoming classes? I have lots available in January, February and March including some kit classes. You can sign up online or you can check them up on my Facebook Group.